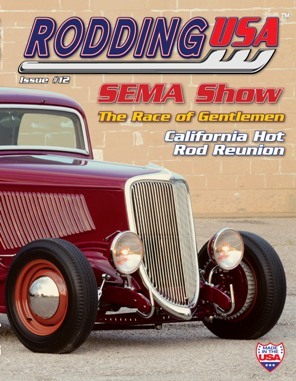 Rodding USA magazine's Issue #12 available to order now. Issue#12 features an other excellent mix of trad-style hot rods which includes Michael Young's deuce coupe which is so darn cool it'll knock your socks off. Our special features include a tour of Squeeg's Hot Rod Connection as they celebrate their 50th Anniversary before we slip behind the garage doors in Colorado to explore another amazing Rodding Digs. Issue #12 event coverage includes full coverage of the amazing SEMA Show - recession?...what recession? Plus we visit the nostalgic California Hot Rod Reunion. On the Tech front we take a look at '40 Ford instrumetns plus liscence plates. All that and more in our regular columns and features and don’t forget our growing list of dealers. Rodding USA, by hot rodders, for hot rodders.